What are the restrictions specific to my carrier? Prohibited and restricted items for the different Chit Chats services. Carriers employ different transportation methods when delivering shipments, meaning shipping restrictions are highly dependant on the carrier. This is important to consider when selecting the right carrier for your shipment. Below you will find a brief overview of the shipping restrictions for each available carrier. For the most current information on carrier shipping restrictions, please refer to the webpages that are linked in each section. Please note that carrier-specific restrictions are in addition to Chit Chats’ Shipping Restrictions. As most international shipments travel by air, they are subject to certain safety regulations for air travel in addition to necessary customs clearance. For this reason, prohibited international shipments include and extend beyond the scope of prohibited domestic shipments. However, as domestic shipments may also travel by air, items prohibited internationally may only be restricted domestically. Typically these restrictions pertain to an item’s packaging or its quantity. For a more in-depth look at prohibitions and restrictions, please see the USPS's Shipping Restrictions. Items that are explosive, flammable, corrosive, or are oxidizers or compressed gases. This include aerosols and household cleaning agents. Hazardous Batteries & electronic/products containing these batteries e.g. cellphone, laptops, tablets, smartwatches, etc. The USPS has a great guide on which items may be considered dangerous goods. UPS MI shipments are also transported by two postal services: UPS and USPS. Naturally, shipments must comply with both carriers’ requirements. 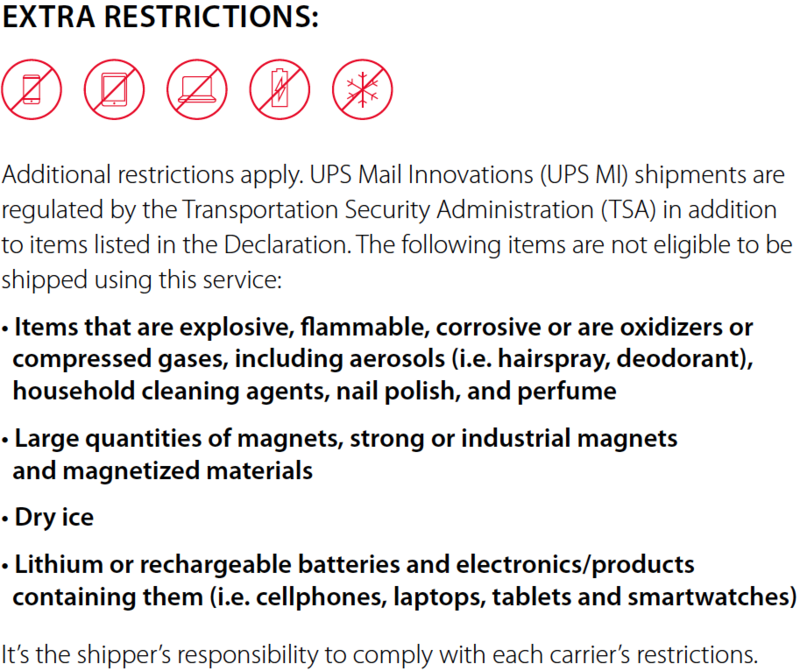 For USPS, please see the above entry; for UPS, please see UPS's List of Prohibited Articles for Shipping. For more information, the USPS has a great guide on which items may be considered dangerous goods. Customs regulations for the destination country must be considered. 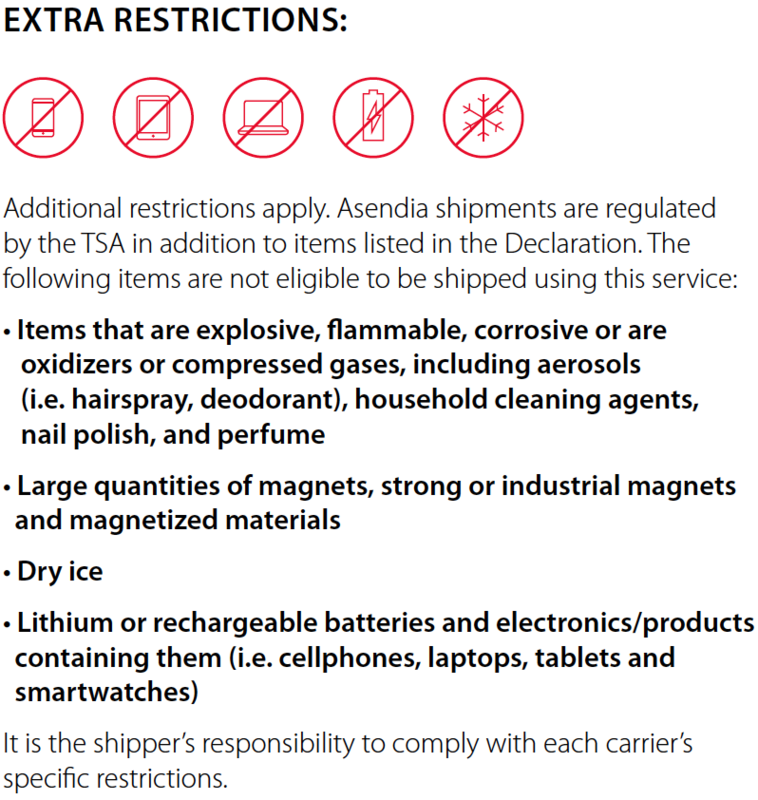 Please also see Asendia’s reference on prohibited items. Chit Chats International Standard shipments travel by air and as a general rule, all dangerous goods are prohibited. You may refer to USPS's guide on Nonmailable Goods for more information on what may be considered a dangerous good.